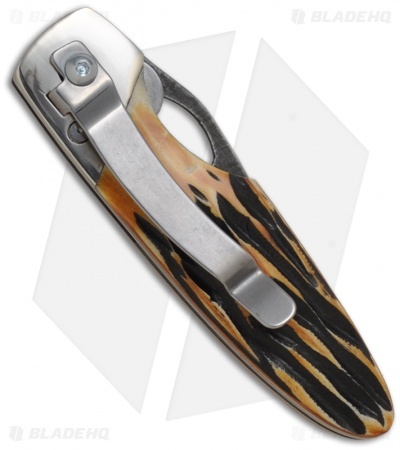 This Sideliner Lock folding knife has a Damascus steel blade with an ambidextrous thumb hole. 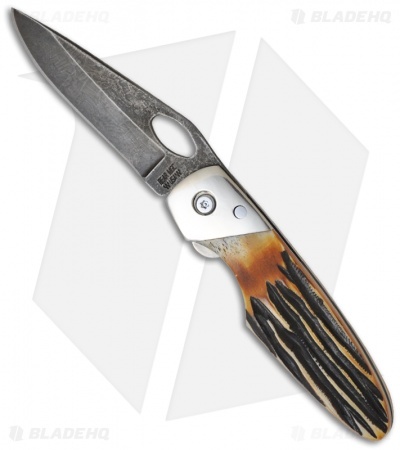 The handle features genuine India Stag Bone scales over a steel frame. The bolsters are nickel silver with a finish you'll appreciate. The ball bearings at the pivot make this one-hand opening knife a breeze. Tip-down clip for pocket carry. I can shut it with one, but it takes two hands to open cause it's stiff, too thick, and has extra resistance just before locking. The grip is all wrong.